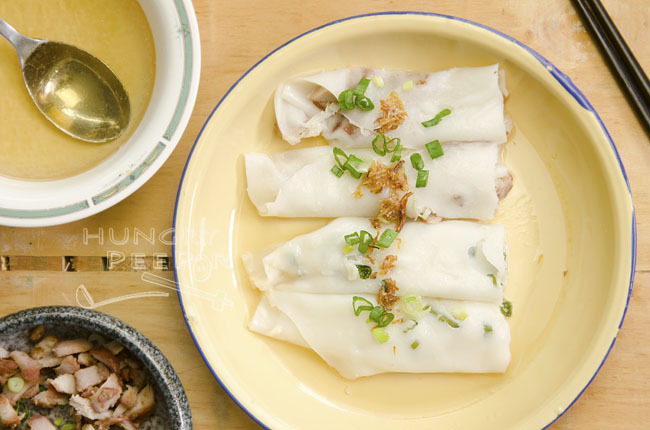 There are two different ways of eating rice noodle rolls. The simpler way is to steam the rolls as they are without any fillings and then eat them with a dose of sweet soy sauce and chilli sauce. This isn’t to my liking at all because I feel that the sweet sauce has a very bold taste which tends to overwhelm the mild flavour of the noodle rolls. The other way is to steam the rolls with some fillings and then serve them with some light gravy. 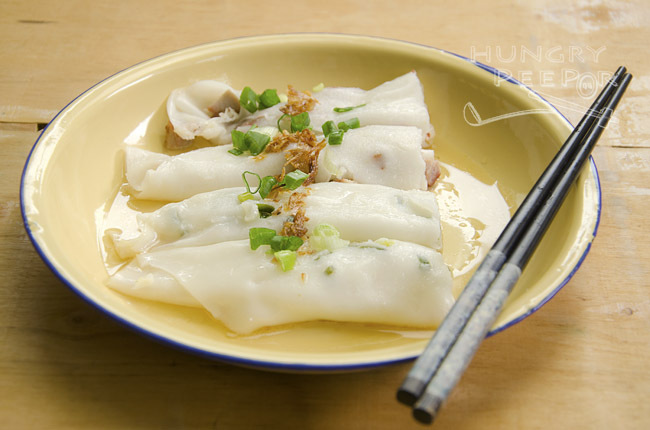 This savoury version of rice noodle rolls is also the version that is commonly served at the Chinese and dim sum restaurants, usually with a filling of char siew or shrimps. Instead of the sweet sauce, a light gravy is drizzled onto the rice rolls with filling which adds another layer of taste to the bland rolls without being too overwhelming. Combine cake flour, cornstarch, salt, oil and water in a bowl. Oil a round or rectangular tray. Pour batter into tray to cover bottom evenly. Place on rack in wok. Distribute 1 tbsp fillings evenly on top of batter. Steam on high heat for 5min. Remove from wok. Float pan in cold water to cool down. Use a spatula to cut the sides of the noodle from the tray. Roll to remove. Repeat steps 2 to 6 until all batter is used up. Top with spring onions and shallot oil. Drizzle with gravy to serve. Use a rectangular glass tray for easier rolling. I used a circular metal baking tray to steam the noodles and because the base is uneven, the steamed result was uneven as well. Use a larger rectangular spatula for rolling the noodles. For the fillings, you can easily substitute them with other things (cooked beforehand) such as shrimps, crabsticks, duck meat and mixed peas/vegetables. I’ve been served a version with rendang at a restaurant before, although that didn’t really work very well for me. This entry was posted in Chinese, Noodles and tagged Cantonese, Dim Sum, Rice noodle, Steaming. Bookmark the permalink.